Have y'all* met Ruth? Because if you haven't, you really should... Ruth Garcia-Alcantud is the super-talented designer behind rock+purl, and tech editor extraordinaire for such luminaries as Mercedes Tarasovich-Clark, Pom Pom Quarterly and Knit Now magazine. She also teaches classes, blogs and Tweets, and is a generally fabulous person. When Allison and I discussed local designers to approach for donations for the GLYC after-party, Ruth was the first person I thought of. So I was thrilled when we got her return email full of enthusiasm and support! Although she sadly won't be able to join us on the day, Ruth is generously donating pattern codes for the goody bags - you can check out her long list of designs on her website or on her Ravelry designer page. In addition, she has donated two prizes for the after-party: two lucky Crawlers will receive her newly-revamped Spiralized Slouch Hat pattern (the version shown on the Ravelry page was knitted by one of our other sponsors, Countess Ablaze! ), and a skein of gorgeous yarn (Artesano British Wool Chunky in Mushroom or Grey) to use for the project. From her email: "The hat is a slouchy beret with plenty of room for heads full of hair and big ideas! The lacy pattern is a girly touch and you can close up the hat with buttons of your choice. The patterns will include the Ravelry download code for the winners to place it in their library." 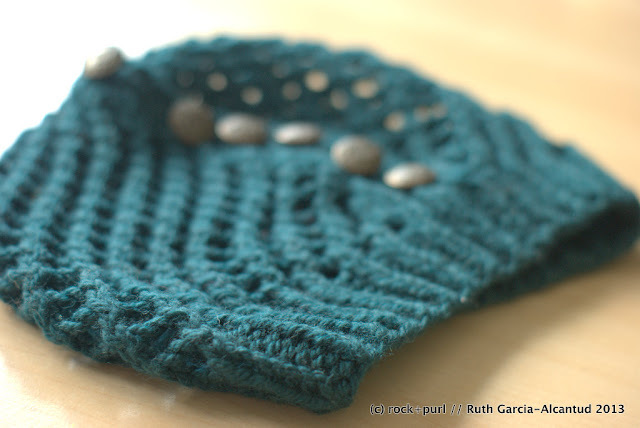 Many thanks to Ruth for her enthusiastic support, and we hope to see her at future yarn crawls! * Little American-isms like this (particularly from the South) are a sure sign that the blog post you're reading was written by Rachel, and not by The Toronto Connection, aka Allison. When we were looking for indy dyers to approach for door prizes, we discovered that Ravelry has a really cool search feature - you can limit the geographical range of the yarnies you're looking at. We were delighted to find that there are quite a few independent yarn painters within 60 miles of London, and we're thrilled to have Sarah of Inked Yarn on Etsy as one of our door prize sponsors. 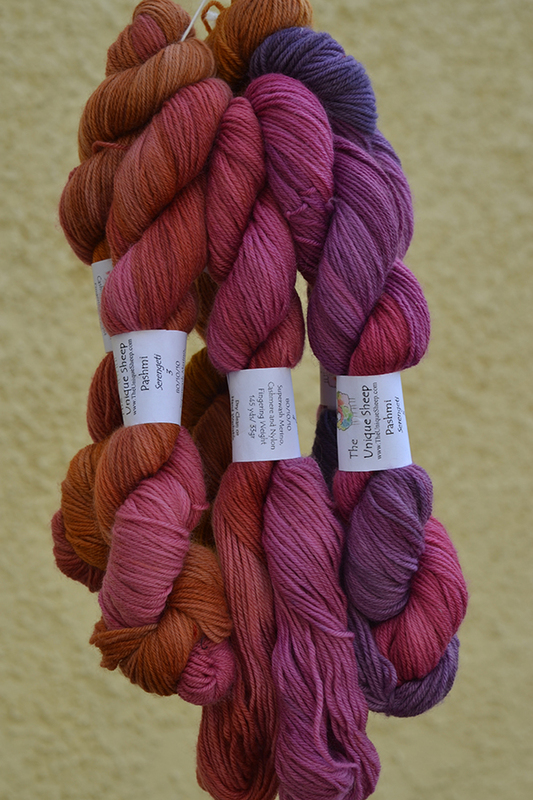 Sarah has sent us two skeins of her gorgeous handdyed sock yarn, and three sets of stitch markers for door prizes. First up is her Doris Sock, a high twist 80% merino/10% cashmere/10% nylon blend, 365 m/100 gr, in the "Sketch" colorway. Next up is Bettie Sock (50% superwash merino/50% silk), 400 m/100gr in "Peppercorn". and my favorites - a set with Alice in Wonderland-inspired charms! Thanks very much to Sarah for her generous contributions, and be sure to make it to the after party for a chance to win some of these goodies! The Village Haberdashery began life as an online source for fabric, notions and yarn, but opened a bricks and mortar store earlier this year. On the day we visited, they had just gotten in a shipment of Blue Sky Alpacas yarn (including Spud and Chloe sweater! ), and let us go pawing through the boxes to check out the colors. For GLYC folks, Annie is offering a 10% discount on purchases made on the day. So if you like to combine your yarny crafting with anything fabric related, be sure to pick the Blue, Green or Purple routes so you can pay them a visit! Don't forget - our early bird contest ends tonight at 23:59 pm, so if you'd like a chance to win an original Soakbox, go and get your tickets now! Like a lot of other knitters, I'm also a mom. And when my kid is at school and I'm not totally caught up in family stuff, one of the other hats I wear is as sales rep for Canadian indie-dyed SweetGeorgia Yarns. Felicia Lo and her team dye the exquisite SweetGeorgia yarns by hand in small batches in their Vancouver studio. In addition to only dying protein-based yarns, they also dye luxurious spinning fibres, and always in the bold, super-saturated colours that the company has become known for. First up - a gorgeous skein of SweetGeorgia Silk Mist in English Ivy, and accompanying Twig Shawl, which is a perfect pattern for this yarn! Two - Another gorgeous skein, this time SweetGeorgia CashSilk Lace in Glacier, partnered with the Shattered Sun Shawl. Both patterns are designed by the very talented Felicia herself! 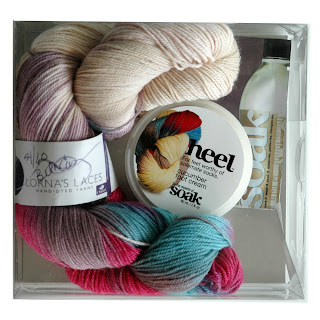 If you can't wait until the Yarn Crawl to see if your luck runs to winning one of these fab door prizes, I can tell you that Stitch Solihull is carrying both of these yarns, and a couple of others as well! You can also find the CashSilk Lace at Purlescence online. Thanks again to Felicia and everyone at SweetGeorgia Yarns, and good luck to everyone at the after party! Rachel and I are both long-time fans of Knitty.com. They've been a meaningful presence in the knitting interwebs for 10 years now and helped to launch tons of designers - gaining them a wider audience of followers and the appreciation of knitters everywhere. They're also fab supporters of the knitting community offline. 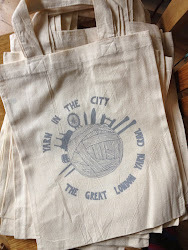 When we decided to move forward with Yarn in the City: The Great London Yarn Crawl, Knitty was the first publication we sent our press release too. Perhaps you saw them help us promote the launch of ticket sales for this year's event? 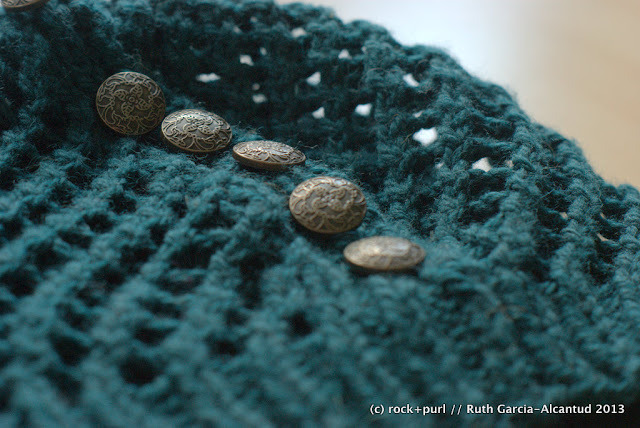 A while back, Knitty editor Amy Singer had her knitting bag stolen out of her car - with her WIP! Horrors! When the thieves realised their mistake, they ditched the bag project along with the project inside - ack! 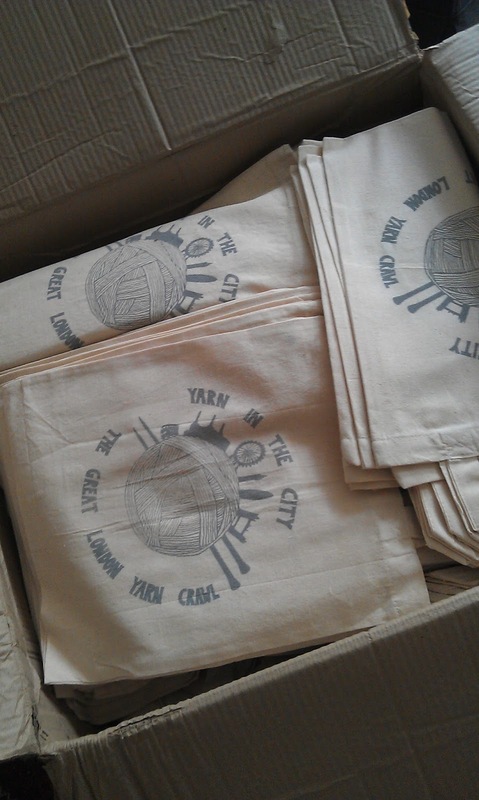 Luckily for Amy, some nice person found the bag and saw the yarn. Bringing it home to a family member who was a knitter, that nice knitter thought, "Someone must be missing this project," but there was nothing to identify who the bag belonged to! 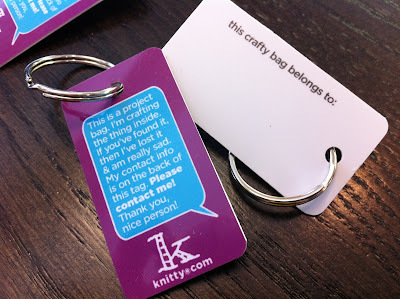 Amy's luck was definitely turning around because the nice knitter found a business card in the bag from an appointment that Amy had been at, they called the number on the card to ask if anyone had lost a knitting bag and lo, Amy was tracked down and reunited with her project! But since Amy always has good ideas, she thought that this was an excellent opportunity to remind people that sometimes we get separated, however unintentionally from our projects and that just because our project bags might be in another bag, we should still have them labeled so that they can find their way back to us. And so Knitty project bag tags were born. A big thanks to Amy and the whole Knitty team! Have you got your tickets yet? Don't forget if you get yours before 11:59pm on August 26th you'll be entered to win an original Soakbox! Because if you do, you should probably pick on of the routes that will take you to Knit with Attitude on Stoke Newington High Street. This shop has a wide range of products, ranging from yarns to needles and hook, patterns, accessories and other goodies, all of which have been choosen to be as environmentally friendly as possible. Knit with Attitude is offering 10% off on all purchases made by participants during the yarn crawl, and they are also including 10% off vouchers in all of the goodie bags. So even if you don't get to visit them on the day, you'll still have a chance to save! And many thanks to Maya and everyone at Knit with Attitude for their support. Don't forget, our early bird registration contest closes at midnight on 26 August - don't wait to get your tickets! Allison and I are very pleased to be able to share some very exciting news with you today; we have a special guest joining us at the GLYC in September. I first met our special guest (if you can call it "meeting" someone if you obsessively listen to their podcast, and have knitting dreams in which you hear their lovely, soothing voice doing the play-by-play narration of your worst knitting disasters) when I fell back in love with knitting sometime in 2006, and got myself an MP3 player and discovered that there were people out there who recorded themselves talking about knitting and then put those recordings on the internet for people to download and listen to for free! Approximately seven years later, and Brenda Dayne and Cast On are still going strong. We were very lucky to meet Brenda last autumn at the Plug-and-Play Pembrokeshire retreat, and the signature line in her emails is pretty much right on target: she is warm, polite, intelligent and funny. We are thrilled to announce that Brenda is joining us this year for the inaugural Yarn in the City: The Great London Yarn Crawl. She will be crawling along with you on one of the routes, and has graciously agreed to grace us all with her soothing voice as the emcee of our after party. Brenda is also supporting the event with a whole pile of fabulous door prizes for the after party. First up, one lucky knitter will go home with an electronic copy of Brenda's upcoming book Welsh for Rainbow. This book contains stories and gorgeous patterns inspired by "the small country to the left of England". You can see all the currently available patterns on the Ravelry page for the book. In addition to a copy of her book, Brenda is also donating yarn for Now in a Minute, her fabulous shawl designed for gradient-dyed yarns, first published in the Spring+Summer 2013 issue of Knitty. This is a set of Unique Sheep Pashmi Gradiance yarn (80% superwash merino/10% cashmere/10% nylon) in the colorway "Serengeti". It will be a fabulous shawl, and I'm sorely tempted to lose it (into my stash) on the way to the pub in September. We are so pleased that Brenda is able to join us, and we are very grateful for her generosity and support. It's going to be a great day in September! It's Allison here writing today's post about our next prize, and I'm really excited about this prize because (gush alert!) 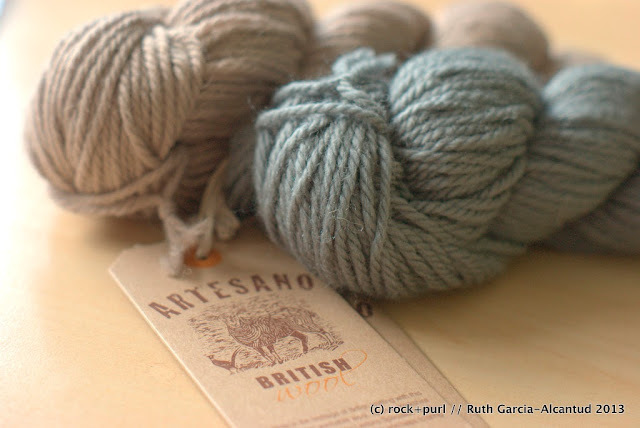 the title of this blog post says it all really: I'm a better knitter because of Kate Atherley. Some of you may recognize Kate's name as she's the Senior Technical Editor for Knitty.com. But in addition to her duties for Knitty, she's also an amazing knitting instructor, teaching at many of the yarn shops in the knitting-mecca that is Toronto, Canada. 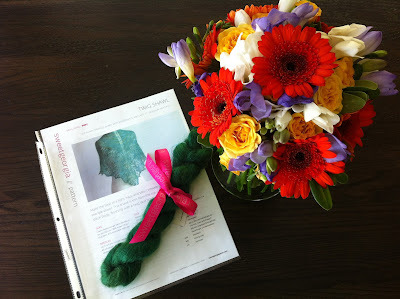 Kate is also a prolific sock knitter and shares many teaching tips on her blog Wise Hilda Knits. 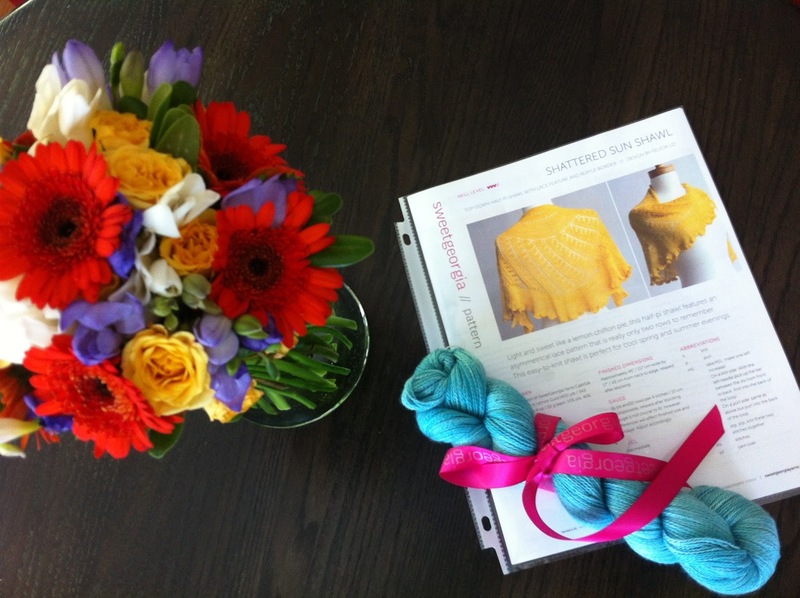 It made sense that Kate would naturally progress to sharing her experience with a wider audience so came about her first book Beyond Knit and Purl. Kate's first book - and not just for new knitters! 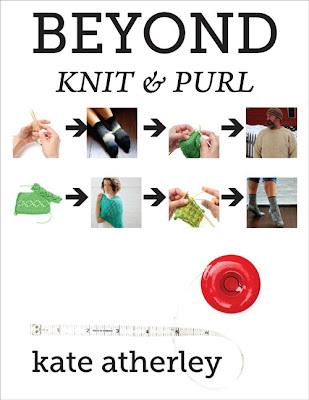 "Beyond Knit and Purl is the knitting book you always wished you'd had when you started but didn't. 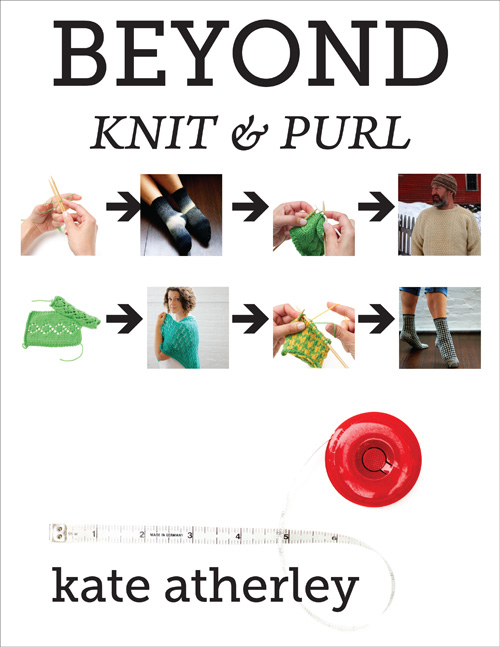 This book is not just for beginning knitters. Even those who've been knitting for years will have an astonishing number of "ah-ha!" moments inside its pages. As a technical editor -- and more importantly -- as a teacher, Kate knows where knitters hit roadblocks and how to overcome them, and she shares her many years of experience in Beyond Knit and Purl." Of course, taking so many courses with Kate over my years in Toronto, I feel very lucky that we became friends along the way too! I'm thrilled that she's agreed to share her book with a lucky winner at our Yarn Crawl after-party. Oh, and did I mention she's also British? I think we should start lobbying her to make a comeback tour to the UK! 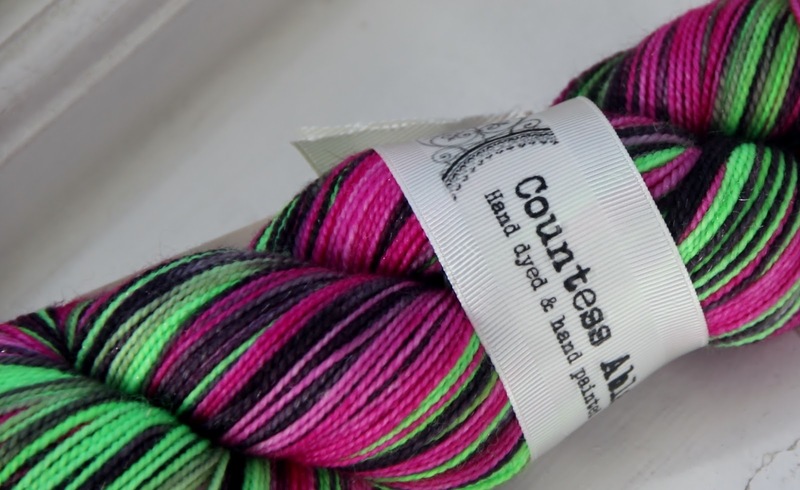 We were lucky enough to meet Countess Ablaze and her glorious yarns in person last October at the Plug-and-Play Pembrokeshire retreat. To say that we were blown away is an understatement! (There were many grabby hands and potentially violent staredowns over the various colorways). When we saw that Lyndsey was back at the dyepots earlier this year, we quickly got in touch to see if she would be interested in sponsoring any prizes at the after-party. She very generously sent us three skeins of yarn to share with three lucky pub-goers in September, and they arrived this week. First is a skein of Viscount of Spark, 400 meters/100 grams, 75% merino/20% nylon/5% stellina, in the "Northern Lights" colorway. Next up is Count Cashmerino High Twist in "Live Another Day", 80% merino/10% cashmere/10% nylon, 365 meters/100gr. Finally there is my personal favorite, a skein of Tia Merino (100% superwash merino, 365 m/100 gr) in the colorway "Ice Queen". 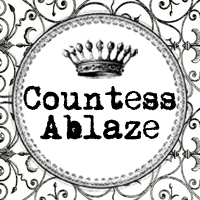 The Countess Ablaze Etsy shop is updated on the last Friday of the month at 7pm UK time. If you miss out on an update, you can find Lyndsey and her gorgeous yarns at the Bakewell Woolgathering on the 19th and 20th of October. Online, in addition to her Etsy shop, you can find her on Ravelry and Facebook. With all the excitement around here about the great prizes that are going to be given away at the after-party, we thought it would be fun to give out a prize BEFORE the event even starts on September 21! And what better way to reward all of you quick-on-the-button-early-bird-ticket-holders than with a contest for having your tickets early for the event? Tell your friends! Let them know on Ravelry, or Twitter, or Facebook just how much fun you're planning on having! If any of your friends buy tickets to the event, send us an email with your name, and your friends' names to greatlondonyarncrawl@gmail.com. You'll get an additional entry to the contest - simple as that! On Tuesday, 27 August we will draw a name using a random number generator to decide a winner! 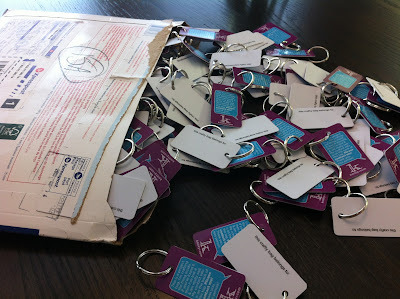 The lucky winner will receive their prize at the start of the event on Saturday, 21, September. So what's up for grabs? How about one of the ORIGINAL Soakboxes? This was the Soakbox that started it all! It comes with their Heel cucumber foot cream and with a skein of Solemate yarn in the custom colourway Maven, a blend of Soak's beautiful teal, fuscia and mauve colours - hand-dyed by Beth Casey of Lorna's Laces. What makes this Soakbox even more rare is that ONLY 60 WERE EVER MADE! And how do you know? Because the skein of yarn is signed and numbered by Ms. Casey herself! Wow!